Easter candy is everywhere and I do mean everywhere! Birds, bunnies, peeps, pastel candies. You name it and it, probably, exists. I saw dark chocolate pastel candies as well as larger egg shaped pastel milk chocolate candies and my mind started racing towards a whole lot of yummy thoughts. 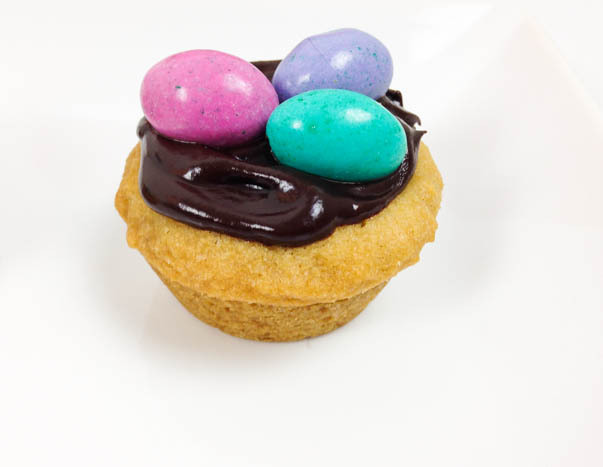 Cookie Dough Birds’ Nests start with a cookie dough base into which dark chocolate pastel candies have been mixed. Rather than scooping them onto a cookie sheet, I pressed the dough into mini muffin cups. 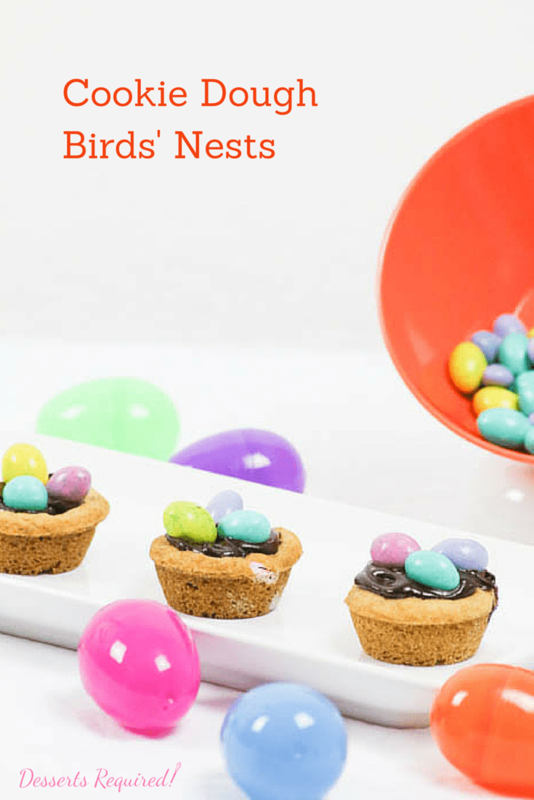 Once the nests cooled, they were removed from the baking pan and topped with heavenly chocolate ganache and a few ‘eggs’ in the form of large egg shaped pastel milk chocolate candies. There were only two things I needed; tasters and a name. The tasters were easy enough to find, thanks to friends who responded to my Facebook request. Fortunately for all of us, everyone loved Cookie Dough Birds’ Nests. The only problem was that I did not at that time, have a great name for these Easter treats. I turned, once again, to Facebook but this time armed with a video asking for help. I posted my video on Desserts Required’s page as well as on Fearless Friends Sharing Recipes, a wonderful group of bloggers who share recipes and tips. There were some really wonderful ideas and it was tough choosing just one name. Cookie Dough Birds’ Nests was suggested by none other than the very talented Jenni Field from Pastry Chef Online. It summed up, so appropriately, what this dessert is all about. 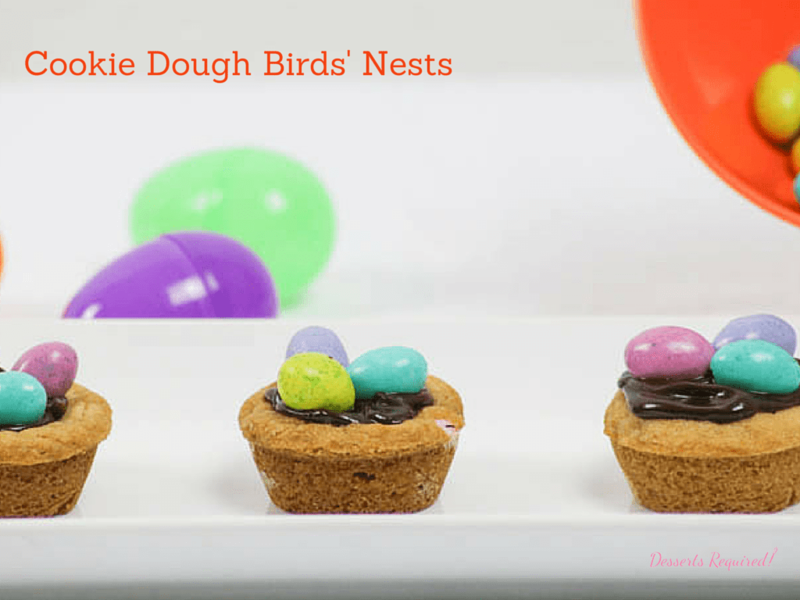 Even if Easter is not your holiday, Cookie Dough Birds’ Nests are too good not to make. Kids and adults will thank you for them and you will only hear ‘oohs’ and ‘ahhs’ from your peeps! Whisk the flour, baking soda and salt together in a medium size bowl and set aside. Place 2 sticks of butter, sugar and brown sugar into a large mixing bowl. Beat on medium high speed until light and fluffy, about three minutes, scraping the bowl down as needed. Add the eggs followed by the vanilla. Blend in the dry ingredients. Add the dark chocolate pastel candies. Spray two mini muffin tins with nonstick cooking spray. Scoop approximately 2 tablespoons of dough into each mini muffin cup and spread into the cup with your fingers. Bake at 350° for 13-15 minutes, rotating the pans top to bottom and front to back halfway through. Remove from the oven and cool completely in the pans. Once the nests are cool, use a small metal spatula to help release each one from the pan. Place the nests on a flat surface and set aside. Place the chocolate chips in a small bowl and set aside. Place 2 tablespoons butter and cream into a small saucepan. Bring to a simmer and, immediately, pour over the chocolate chips making sure that the chips are all under the surface of the liquid. After 4 minutes, slowly stir the mixture until the chocolate is completely melted. Open a quart size plastic freezer bag and place it into a tall glass. Pour the chocolate ganache into the plastic bag. Seal the bag and cut off a small piece of a bottom corner. Squeeze the chocolate over the top of each cup in a circular motion, starting on the outside and working your way in to the middle. Place three 'eggs' onto the chocolate ganache. Thank you, thank you, thank you for showing the products you use. I had ordered the measuring cups and the lemon juicer. It’s the first time I ever knew such a thing as a lemon juicer existed. I know I’m slightly behind the times!!! What a pleasure. I didn’t waste 1/2 the lemon squeezing the juice with my hands and I didn’t have to bring out my big juicer. And to think that I now own 1/8, 2/3 and 3/4 measuring cups. Wow! If you use any other items that make life easier, don’t hesitate to post them! Perhaps 1/2 the world, already, owns all of the above; but I didn’t and now I do!!! I am SO glad to read this! I, finally, got around to putting some of my favorite things on the website. I am thrilled that you found some things to add to your kitchen collection.